Just a short drive from the dreamy tropical beaches of Khao Lak is the inland town of Takua Pa. Most know this small town as simply a bus stop-over on the way to a beach party or diving adventure. But take a wrong turn down some winding roads and prepare to be transported 60 years back in time. What we know today as the main town of Takua Pa is simply the younger brother of Takua Pa Old Town, a relic from the Sino-Portuguese Tin-Mining era. When the roads were diverted north, time seemed to stop in Old Town. The same businesses have been operating here for fifty years or more - hairdressers, restaurants, seamstresses - all with a loyal clientele of friends and locals. During the week, you'll love to explore what is a living museum of early 20th century Thai daily life. On a guided tour you'll be taken down the quiet streets to meet the local personalities and sample delicacies that have a distinctly Chinese and southern influence. Every Sunday though, sleepy Old Town takes a double espresso and comes alive with a vibrant market and walking street down the main road. Over a long lazy afternoon and evening, you can graze on all the local delicacies you can imagine! You'll find many classic Thai Kanom (snacks), as well as live performances, arts and crafts, and much much more. Clockwise from left: Fashion comes to Takua Pa - Photo by Jo Surat, Takua Pa locals living the 'slow life', local snacks at the Takua Pa Sunday market, meet the friendly locals, more delights to sample at the Takua Pa Sunday market. 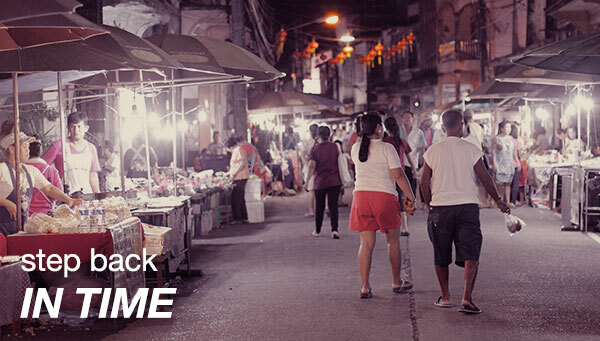 Journey back in time for yourself next time you're in Khao Lak. Casa de La Flora can organise day trips and weekend market extravaganzas, and of course a friendly guide to help you sample the culture and food of Takua Pa.